Multi-talented Beard Bates acts as producer, engineer, graphic artist AND multi-dimensional solo-artist (with a little help on percussion from brother, Carter) on his debut full length "Lightyear's Tightrope". Possessing enough eccentricity to pull off a mosaic of sounds, ranging from twangy back-mountain banjos to jazzy electro-trance, Beard has successfully engineered a cd worthy of his obvious talents... be they as musician, poet, or painter (all graphic design and artwork on this cd is also created by Beard). Forget a track list, Lightyear's Tightrope rings in with 23 tracks; however several of these tracks are samples denoted simply by an asterisk. Titled tracks are hard to interpret, given to the graphics of the CD cover, but from my best efforts at deciphering they include: "Lightyear's Tightrope", "Glasser", "Fell on Blue", "Lost My Hold", "All Around the World", "Donjee", "Wider Gaze", "In the Morning", "Carter's Song", "2102B", "Inappropriate Smile", "Waterfalling", "Older Women", "Selfishly Snide", "Sajj", and "Bottom of the Sea". 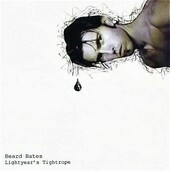 I asked Beard, "Why did you decide to call this cd, "Lightyear's Tightrope"? Beard responds, "Well, the way I usually write songs is essentially: the song writes itself... much in the way many stream of consciousness poets write and are inspired. I don't really know what's going on most of the time while I'm playing and writing, yet afterwards it is quite interesting to analyze what has been laid down. On the title track I sing from the odd removed-perspective of someone who has either died or does not exist in our reality--this character, or perspective wishes to come, build his or her way, to our reality in light of giving us some message, or so it would seem. When I sing in the bridge, "and I'll build with them [referencing bones and dreams] what you never thought you see, a Lightyear's Tightrope for walking your world to me," this seems to me to infer that the character portrayed in the lyrics wishes to connect with our world for either to issue some blessing, reacquaint with a friend, or unfurl some grand explanation. However, "Lightyear's Tightrope" can mean something totally different to everyone, according to what each listener brings to the table... you have just as much right in defining what my songs mean as I do. The fun and beauty in inspiration is that it pops up hear and there and truly makes us think and create. And yet, as you'll see, everything is not so ethereal and cabalistic... I do have, perhaps, a goofy sense of humor." Hmmmm. I think this sense of humor definitely pops out in the track "Older Woman", where Beard sings as an elderly English woman working in her garden. (And I thought it was going to be a sordid song about a steamy love-affair with an older woman!). My personal favorites would include the lovely "Fell on Blue", which tugs at the heartstrings; Track 12, appropriately named "Carter's Song", which showcases Beard's brothers' percussion talents in a middle-eastern influenced instrumental piece; and the electronic instrumental, "Donjee". Track 11 is a very interesting piece. Upon listening to this track several times, I was feeling quite perplexed. At first I thought this was a foreign language spoken word track (a very beautiful, flowing language reminiscent of Navajo or Cherokee sounds); but after listening to this track again and again, I realized this was, indeed, English. I asked Beard to please enlighten me. Beard states, "The spoken word, poem, is essentially an a-linguistic, insofar as it doesn't use words of any meaning, but simply words chosen for their sonal texture and rhythm. I wanted to include the poem because it can show how, after listening to it in entirety (and in essence at the end feeling that some sort of meaning or closure has evolved), sounds can be emotive and meaningful in themselves... i.e. music." Beard seems to take to heart a quote from Track 16: "I'm playin' in the game of life. I take it easy though. Because it's all good." Such seems to be the philosophy behind the music of Lightyear's Tightrope. Welcome to the sundry aisle. If you don't find something you need; perhaps you will find something you want. There is plenty to choose from here.